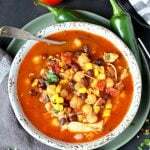 Instant Pot Mexican Chicken Soup, an easy and tasty way to add some flavor into your meals! Turn the Instant Pot on sauté mode. When hot add in the oil. Sauté the chicken breasts on both sides, about 5-6 minutes on each side. Pour in two cups of chicken stock. Cancel out sauté mode, cover and seal the valve. Cook on high pressure for 8 minutes, when done release all pressure and open the pot. Transfer the chicken to a large plate or platter. Using two forks, start to shred the chicken completely. The chicken should be able to come apart very easily. When done, transfer the shredded chicken back into the pot. Add remaining ingredients at this point, including the remaining two cups of chicken stock. Season with taco seasoning, red pepper flakes, salt and pepper to taste. Give it a good stir. Cover the pot once again and seal the valve. Cook on high pressure mode for 3 minutes. When done, quickly release the pressure. Serve with avocado (or guacamole), cilantro, fresh jalapeño slices, sour cream and plenty of tortilla chips.